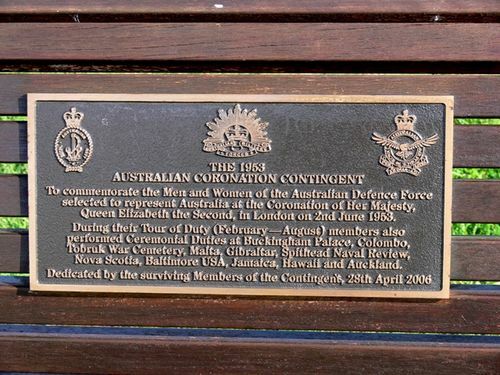 A seat commemorates the men and women of the Australian Defence Forces who represented Australia at the coronation of Queen Elizabeth II in June 1953. To commemorate the Men and Women of the Australian Defence Force selected to represent Australia at the Coronation of Her Majesty, Queen Elizabeth the Second, in London on 2nd June 1953. Nova Scotia, Baltimore USA, Jamaica, Hawaii and Auckland.